Equity markets witnessed a tiny rise in the holiday-shortened week of trading. Both the S&P 500 and Dow Jones Industrial average inched just 0.3% higher. The Nasdaq composite slipped slightly, or 0.1%. While the equity markets were closed immediately following the disappointing jobs report on Friday, the bond market reacted before closing at noon. The yield on the 10-year Treasury fell to a two-month low of 1.8%. 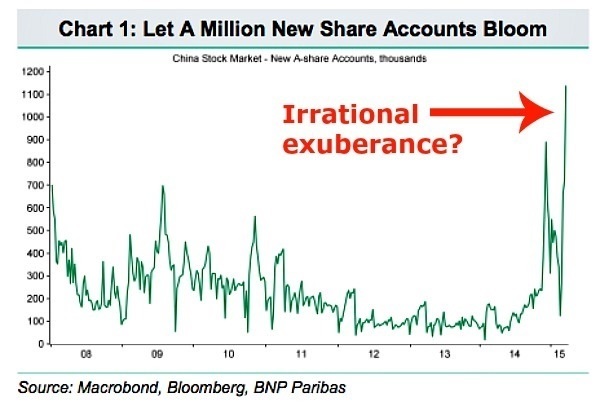 Ready to Burst In China? While a lot of attention has been given to China’s potential housing bubble, less has been made of the potential stock market bubble, until lately. Chinese stocks have been one of the world’s best performing asset classes over the last nine months, having risen nearly 80%. This has occurred in the face of GDP growth slowing to a 20-year low and an 8% contraction in corporate profits. Despite this, Chinese investors have opened new investment accounts at a stunning pace over the past six months, largely because there is nothing better to do with their savings. Banks pay paltry interest, the real estate market is beginning to crack and several capital controls exist to keep the money from moving offshore. Many seem to be borrowing to play the stock market too. The number of margin accounts more than doubled in December 2014 to 12% of all new accounts. When oil prices tanked in the back half of 2014, several contrarian investors went fishing for companies that would benefit from a quick rebound. Some may be changing their tune now. Mutual fund managers who interviewed for a recent Reuter’s article now see an oil glut that they expect to stick around for a while. Many are now shifting attention to companies that can benefit from lower oil prices. Interestingly, professional and individual investors are coming to different conclusions. While many professional investors are sitting on the sidelines waiting for another leg down in the price of oil (some expect per barrel lows to reach $20), retail investors have been driving big inflows into energy related Exchange Traded Funds (ETFs). Those focusing on oil and gas have captured 20% of the net inflows to all ETFs this year. This compares to just 2.5% in the last quarter of 2014. Retirement savings is rising. 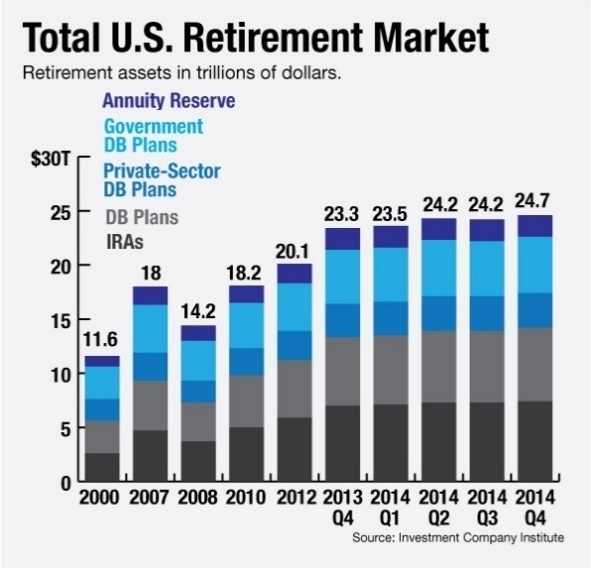 The total assets in U.S. retirement accounts rose 6% in 2014 to $24.7 trillion, according to the Investment Company Institute. 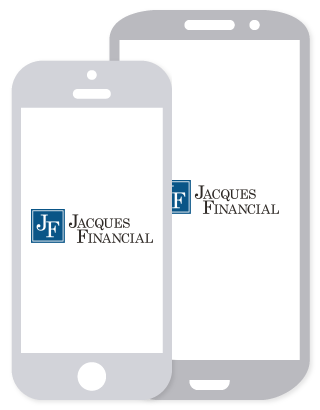 This accounts for slightly more than one-third of all household financial assets. Within the retirement assets, approximately $7.4 trillion were in IRAs, nearly half of which are invested in mutual funds. Surprisingly, defined benefit or traditional pension plans still account for one third of total retirement assets with most of these coming from the public sector. In early 1954, Roger Bannister broke what was thought to be a mythic barrier, running a mile in under four minutes. It took him nearly a year of trying; his first attempt in 1953 was 4:03:06. Today, the world record is held by Moroccan Hicham El Guerrouj who clocked in at 3:43:13. Last week another record breaking run occurred on a track in Australia when Jim Hansen broke the beer mile record with a time of 4:56:25. A beer mile consists of running four laps around a quarter mile track and chugging a 12 ounce beer prior to each lap. While it sounds like nothing more than college hijinks, the beer mile has caught the attention of serious runners worldwide. Like the four-minute mile barrier, the five-minute beer-mile barrier was considered unattainable until broken last year. So far, only two people have run it faster.